City of Delaware Police Capt. Adam Moore, pictured, graduated first in his class while enrolled in the Certified Law Enforcement Executive program. City of Delaware Police Department Capt. Adam Moore recently completed the Certified Law Enforcement Executive (CLEE) program held at the Ohio State High Patrol Academy in Columbus. Of the 29 individuals who graduated from the program, Moore turned in the top academic score, earning him special recognition. Presented by the Ohio Law Enforcement Foundation, the leadership training program is offerred to police officers who hold the rank of sergeant or higher who are at the executive level or wish to progress to executive levels within their agency. The website also states tuition and room and board are waived for students from Ohio law enforcement agencies through a grant from the Ohio Department of Public Safety. A City of Delaware press release states while Moore was enrolled in the CLEE program, he studied a variety of law enforcement and leadership modules. They included ethics, interpersonal skills, strategic planning, risk management and resource allocation, and budgeting. 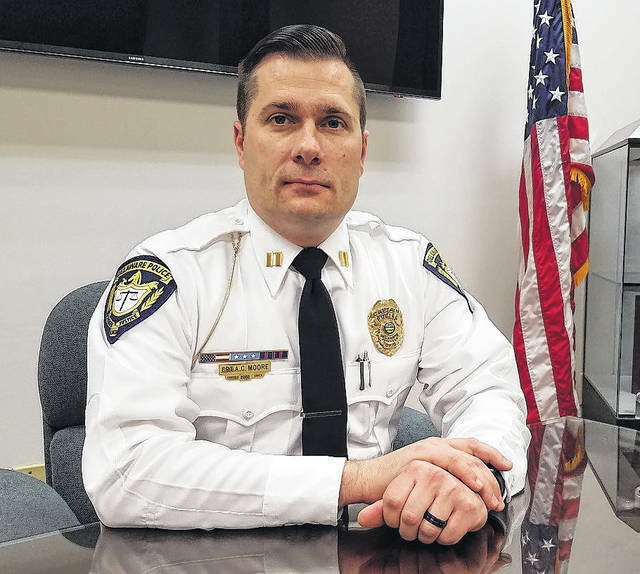 Moore, who holds a degree in criminology/sociology from The Ohio State University, began his career with the Delaware Police Department in 2002 and was promoted to captain in 2012. During his time on the police force, Moore has served as a patrol officer, school resource officer and detective, the release states. With a staff of nearly 60 employees (54 sworn officers), the Delaware Police Department is the city’s largest department.